AS ONE of the few Wakefield Trinity players to experience Wembley, Jacob Miller knows all about the magic of the Challenge Cup. The Australian got there with Hull FC in 2013 and hopes to repeat the feat with Trinity who head to Huddersfield Giants in tonight’s crunch quarter-final. Wakefield, of course, have not reached the final since 1979 when they lost 12-3 against Widnes. Half-back Miller played at Wembley within a few months of joining Hull from Wests Tigers – and just two days shy of his 21st birthday – but was on the end of a 16-0 defeat to Wigan. “It was obviously a disappointing game personally and as a team,” he recalled to the YEP. “But the whole week, the build-up of it all, is great and a wonderful experience. “The way the fans and everyone gets behind it is something I’d love to do again. “I didn’t have much of an idea about the Challenge Cup before but once I came over I realised it was pretty special. “I don’t know need to tell the boys about it here. They all know – even if they’ve not been there – what a great occasion it will be if we could get there. “We’ve spoken all week about how much it would mean to the Wakefield club and the fans. “We know how we need to put a big performance in against a Huddersfield team who are coming in on the back of a good win against Salford. Wakefield did win 10-2 at Huddersfield less than a fortnight ago, a result that essentially cost Giants boss Paul Anderson his job. But, after a brilliant run, that is Trinity’s sole victory in their last four games having been soundly beaten at home by bottom-placed Leeds Rhinos last Friday. As well as a need to progress in the Cup, Wakefield must also surely win this evening to recapture some form to ensure they do not lose grip of their hard-earned top-eight place in Super League. Miller said: “We just want to win every game no matter what comp’. “We’ve had a few disappointing results so we need to get back in the winners’ circle, but it’ll be difficult against Huddersfield. 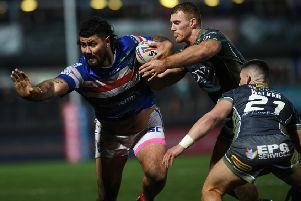 Miller has forged a fine partnership with Liam Finn – who played at Wembley with Castleford in 2014 – and out-gunning Danny Brough, the experienced Huddersfield playmaker, will be key if they are to reach the semis. “He obviously controls the game for Giants,” said the 23-year-old. “He’s a great player who can kick them out of trouble. “We just need to make sure we stop him; he controls the whole game but hopefully we’ll limit the time he has with the ball and slow him down a bit. Wakefield must do it tough tonight, however, without injured captain Danny Kirmond and vice-captain Nick Scruton, Finn taking over as skipper as he did against Leeds. “We’ve lost a couple of leaders there,” admitted Miller. “But we spoke during the week about a couple of others stepping up and being leaders.